One of the games was set during the time of the Crusades. One of their props was a helmet made from a waste basket painted silver with some modifications. Peter was very impressed. As we were there on the last day the guys running the game asked if Peter wanted the helmet. "Yeees" he said in amazement, "Thanks"
He immediately went and put it on. 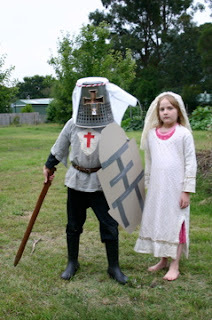 Once we arrived home he quickly made a shield from cardboard and tape and Clare joined him as a princess. It has been said that Macs make computers child's play, but we were still surprised at Rose's abilities. 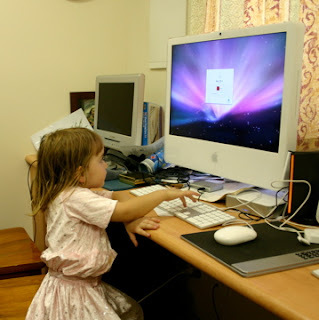 When she is allowed to use the computer, she will press a key on the keyboard. If Lana has been using the Mac, it will ask for Lana's Password. So Rose clicks the button which goes to the list of users. Every member of the family (except Martin) has an account. This way we can control Internet and application access and track usage via the parental controls features. Rose scrolls down to her name and clicks it. She then types her password "rose" and presses enter. This gets her in. Then she clicks Firefox and selects her favourite "Starfall". She then begins to play her games which are all involved in helping children read. That isn't too bad for a child how is just over 3.5 years old. Perhaps it was the early exposure she had as shown in an earlier posting. I must say that those that comment Bruggie Tales area clever lot. Our latest commenter Therese has this marvellous YouTube clip on her blog of a family singing (badly) a custom made 12 Days of Christmas. The words are all based on comments they receive when they go out as a family from strangers. It all sounds very familiar! We are at Defcon 3.0! Not only has Martin fought off his illness (and a lovely peace was heard throughout the night) but he has started to walk unaided. 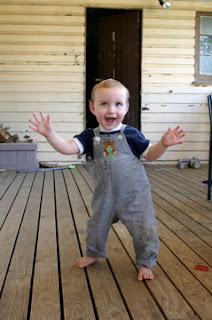 At 8.5 months he stands up from a sitting position and wanders towards his target. We are at Defcon 3.0 (see here for the scale). Lego and other creations are no longer safe at their old heights. Life at the Bruggies has notched into another level of interesting. This is Martin. He is miserable. Croup is such a draining virus. We had a great time in Melbourne, catching up with family and friends, but we unfortunately returned with an unwanted gift. Croup. There is little that sounds more pathetic and sad than an 8 month old child crying and wheezing, trying to catch his breath, and when he does breathe it hurts, and so tired and unwell that he can't sleep. This led to two nights of minimal sleep for Lana and I. Everyone in the family has contracted this bug, one at a time of course. Thankfully, Martin has now recovered and is his normal happy self. He has even begun taking his first tentative steps. We'll have more on that story on the weekend. Meanwhile, this photo tells another story. Namely the great way in which the whole family comes together when in need. Each of the children assist in taking care of each other, and keeping quiet when needed. When Lana and I finally got Martin to sleep late in the morning, the children moved the breakfast gear into the spare room so that they wouldn't disturb us. It was their idea! And they cleaned it all up later too. Isn't the Internet amazing? You can find all the really important stuff a mouse click away. Courtesy of the Evil Mad Scientist.